I am pretty excited about my electric bill for September as it would have been under the 2016 rate structure. 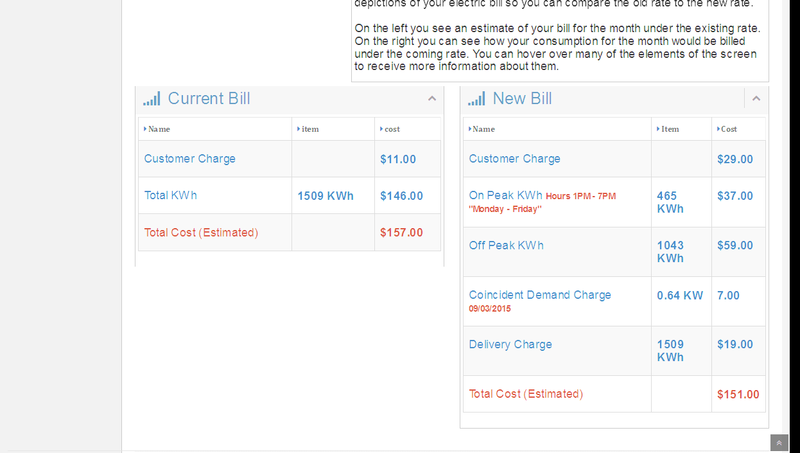 Using the bill comparison feature of our Infotricity Energy Portal as you can see here, my bill under the new rates would be $6.00 lower than it is under our existing rates! In September Glasgow set it highest hourly demand on September 3 at 3:00 in the afternoon. Your EPB team predicted that afternoon as a possible monthly peak (and making that prediction so early in the month is very tough) so I raised the setting on my air conditioning for the afternoon and also put off any other significant electric power consumption until after 4:00 pm. That is all I did. It did not require any expensive technology nor did it take large changes in the way my home operates. I moved my thermostat set temperature from 75 up to 80 for four hours. The result was a contribution to Glasgow's peak demand of only .64 kW and that is the reason why I would have saved $6.00 under the 2016 rate. We don't want to be too repetitive about this, but if you are not monitoring your home's energy usage and using the bill comparison tool on your Infotricity Energy Portal at https://portal.glasgow-ky.com/ you are missing a great opportunity to practice changing your energy usage so that you can best adapt to the new rates which will go into effect on January 1 2016. But please be aware, if you use the comparison on the first few days of the month, it is going to look shocking. Since the Coincident Peak Demand resets at midnight on the first of each month, then each hour of the new month becomes the peak hour for the month. The result is that you will see some surprising Coincident Peak Demand numbers until the data settles and the weather causes a legitimate peak demand. As you can see, these rates will be like nothing you have experienced before as they are unique in our nation. We are also launching a new website totally devoted to giving you more information about the new rates. You can visit it at www.infotricity.org where many of your questions and confusion about the new rates will be answered and straightened out. The new rates will precisely track each customer's use of energy as individual usage matches up to the wholesale rates we must pay TVA for the electric power we all enjoy. After January 1 there will be different rates for on-peak kWh and off-peak kWh and, most importantly, there will be a coincident peak demand charge which represents each account's contribution to the maximum hourly peak for the month. These rates should begin to reshape the way energy is used each day in Glasgow, and that reshaping will allow TVA to make more of our energy with lower cost, and much more environmentally sustainable, energy sources. In the long run, we will all benefit from a reduction in the construction of new generation facilities, and we will be properly positioned to maximize our utilization of renewable energy resources. This concept begins in Glasgow, but we hope it will quickly spread to other TVA utilities. As that happens, each community's environmental footprint will shrink and we will all leave the region in better shape than we found it.